The cosmic twins, maple and soy, envelop the salmon. The discussion of soy and maple syrup made me want to do my favourite salmon marinade, as sockeye is now in season here. This marinade – which then roasts into a tantalizingly tangy umami-a-go-go glaze – combines very simple ingredients, complementing the others well. I developed this particular variation after many years of experimentation, including the original suggestion for soy-ginger-brown-sugar-garlic from a former staff of mine, who hails from a very remote island off the northernmost tip of big Vancouver Island. My variation includes lime juice and red pepper flakes to make it more complex yet balanced (copacetic in a molecular way, as a nod to the west coast origins of this dish). I served the salmon with a simple mixed green salad with tomatoes, medium-firm tofu cubes, sesame seeds, and a super quick and amazingly flavourful dressing from Krissy and Daniel at The Food Addicts (one part ponzu to one part vegetable oil, such as Canola, which I combined in a mini-food processor). This dressing would complement many an Asian-themed meal, including this one. I suspect salmon must be the molecular twin of maple, soy, ginger, garlic, and lime, too. If not, the ingredients are very friendly relatives, at the very least. 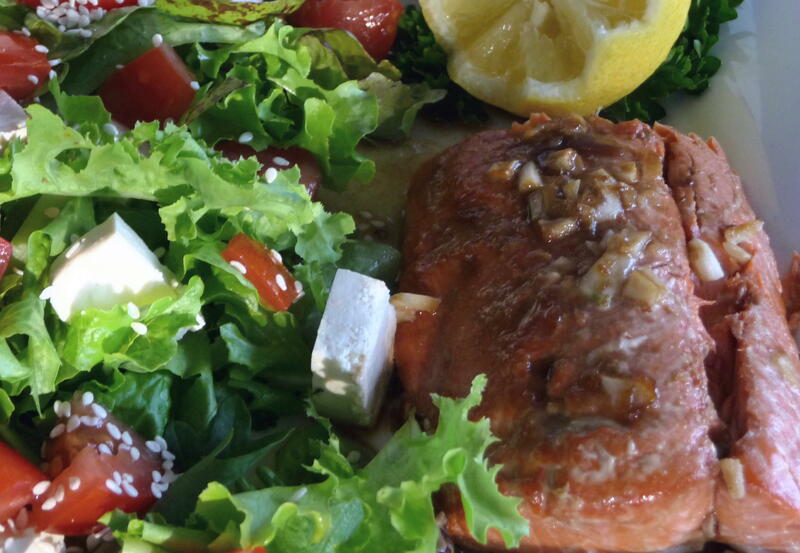 Place salmon flesh side down, in marinade, refrigerate for one-half hour. After the marinading has finished, flip over the fish, and place the salmon, skin side down, in a non-stick pan (for easier clean up, believe me), and pour marinade over fish; I like to poke the salmon in many places, with the tip of a pairing knife, so the marinade will get into the flesh better. Roast for 15 minutes or so, at which time it is good to check the salmon’s progress. Depending on the salmon’s thickness; it is finished when the fish flakes easily but is still slightly translucent. 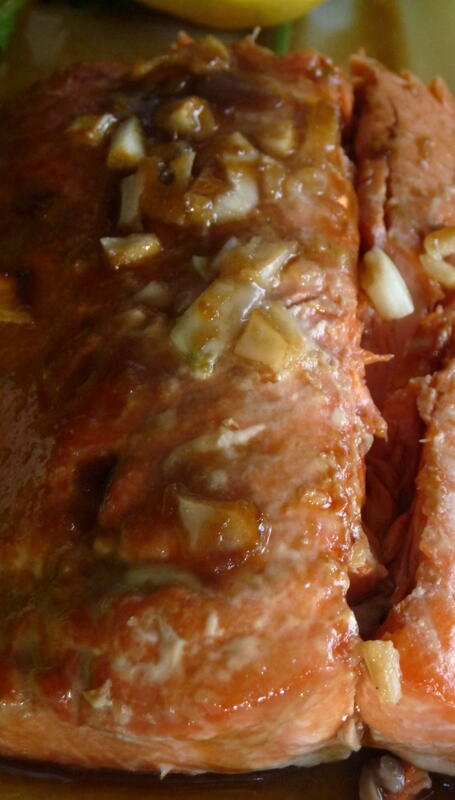 Spoon remaining thickened glaze over salmon and serve with wedges of lemon or lime. 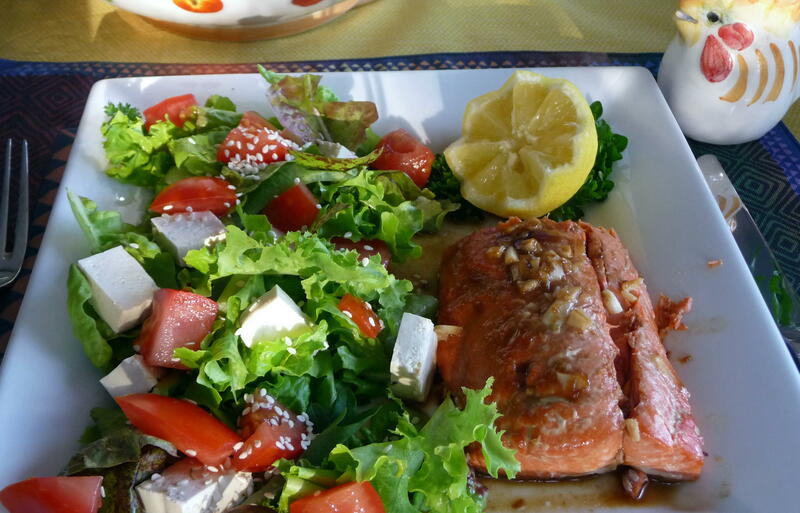 This entry was posted in Main courses, Recipes Misc, Salads, Seafood and tagged Asian, Fish, Ginger, maple syrup, Recipe, salmon, seafood, soy sauce. Bookmark the permalink. glad you got the chance to try the ponzu sauce! so easy, right? it’s great with the soft tofu! great job on the whole meal itself.. looks delicious! Also, I LOVE YOUR KITTY. Wow, he is cuuuute. 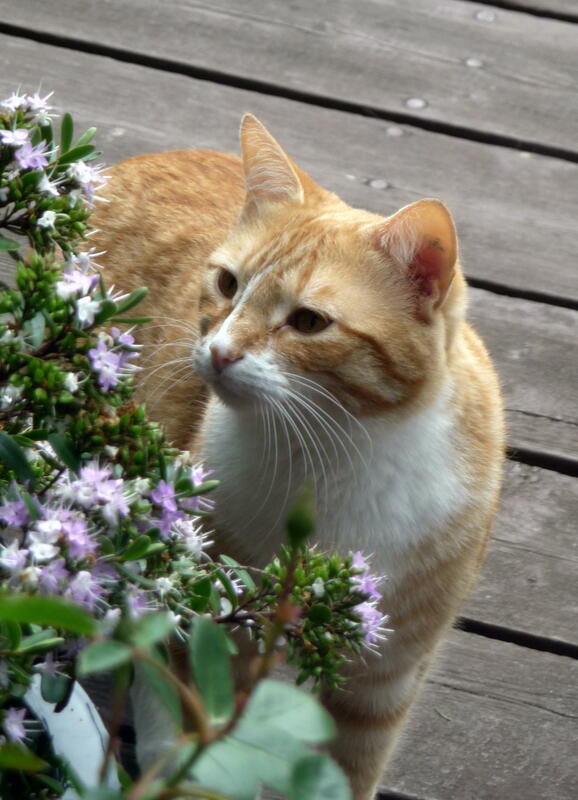 I got woken up by the kitty at my boyfriend’s house this morning – there was a mewing from outside, then suddenly the mewing was on the windowsill, and then PLOP, Tyson was on the bed, alternating between mewing in my face and head-butting me repeatedly. Nice alarm clock, eh? Hi, Jax. I agree about food-combining, though I’ve made some pretty bad mistakes, now and then, in experimenting – probably by trying to be too creative…. Made this last night….was a flavorful big hit. Had trouble getting thick or carmaelized enough to be a glaze, more of a marniate. Any suggestions? More syrup? Add brown sugar? Just before taking it out of the oven, I did broil it for a few moments to darken the top and try to thicken the glaze/marinate. Agree with the “gut” pairing. I was searching the web for a salmon recipe that had ginger and maply syrup….then added soy into my search as I kept getting OJ as the next key ingredient.